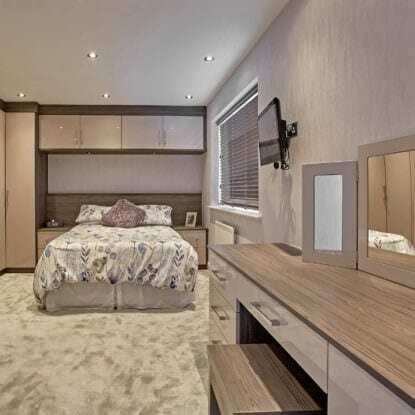 When Mr & Mrs Ross decided to transform their kitchen, they came to Fineline Oldham recommended by friends who had previously had fitted furniture from us. Our designer then proceeded to collaborate with Mr & Mrs Ross and the builder to transform their existing kitchen into a spectacular open plan kitchen and dining space with a large utility. To achieve this fantastic space, considered building work was carried out to the downstairs rooms to create the open plan kitchen & dining flow that Mr & Mrs Ross were looking for. The finished look is in our Porter Matt handless range in Dove Grey with Fleetwood Graphite. Mrs Ross wanted a stylish but durable statement worktop, with a breakfast bar facility. On the island worktop we have used a revolutionary new product called Neolith. The colour used was Strata Argentum textured. This product gives a sleek finished look, inset into the Neolith is an Induction hob with built-in hood and adjoining is a breakfast bar in Fleetwood Graphite. This spacious island is a communication hub that connects the cooking and dining area, quite the party location! This contemporary kitchen is stunning, its bright, spacious and very functional with a variety of Neff appliances installed. Although this kitchen is spacious you don’t have to walk far because of constant kitchen zone planning. To be able to take pleasure in a kitchen’s beauty, it must also be functional, this is most definitely the case for Mr & Mrs Ross. Take a look at some of the other projects by the Fineline design team to see how we have transformed our customers’ homes.